The most important financial market indicator right now is not the Dow, not swap spreads, and defintely not the TED spread. It's not even Libor (though Libor is still important, for obvious reasons). It's volatility. The most widely-used measure of volatility is the VIX, which measures the implied volatility of options on the S&P 500 index for the next 30 days. The VIX is commonly called the "fear index," which leads to the impression that the VIX is purely a measure of investor sentiment. But given the importance of volatility in financial markets, especially right now, it's much more than a measure of investor sentiment. Volatlity is important because it dramatically affects banks and hedge funds' value-at-risk (VaR). VaR estimates the maximum a bank or hedge fund can expect to lose over a specific time period at a given confidence interval. VaR is the primary tool of risk management. Low volatility leads to low VaR, and high volatility leads to high VaR. Banks and hedge funds' leverage ratios are generally tied to VaR—the lower an institution's VaR, the more it can lever up. More importantly for right now, the higher an institution's VaR, the less leverage it can use. The problem is that we experienced an unusually long period of low volatility this decade, which allowed banks and hedge funds to lever themselves to the hilt. In fact, the low volatility stronly encouraged banks and (especially) hedge funds to lever themselves to the hilt—profit opportunities get snapped up faster during boom years, so hedge funds need to lever small profit margins to maintain their high returns. 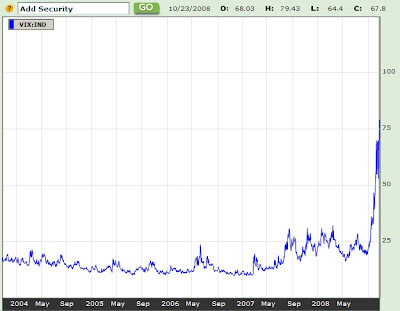 But when Lehman failed, volatility spiked to unheard-of levels, and has remained there ever since. Just look at the five-year chart of the VIX: Because financial institutions base their leverage on VaR, the ridiculously high level of volatility post-Lehman has forced them all to simultaneously raise huge amounts of cash to reduce their leverage. The result has been the mother of all coordinated sell-offs—everything must go, and no asset class is safe. Of course, the mass forced liquidation has just increased volatility, forcing yet more fire sales, and leading to still-higher volatility. And so on, and so on. Gillian Tett of the FT, who is the only mainstream commentator I've seen highlight the leading role of volatility in forcing the mass sell-offs, reported that banks are also reducing their leverage by slashing their lending to hedge funds. I haven't seen a whole lot of that, but given the current state of the markets, reducing lending to hedge funds would seem like a better way to reduce leverage than selling into illiquid markets. I wish I could say that this vicious cycle will end soon—or that it will end at all—but from what I've seen and what I hear from others, there's still no end in sight. The phd application personal statement is the best executive system to get high quality of study. Thanks for this post. eToro is the best forex trading platform for beginning and advanced traders.